11 November 2014 – On the heels of an announcement yesterday that the records of the United Nations War Crimes Commission were made open to the public for the first time in 70 years, a panel discussion examining the historical significance and potential use of the records was held this afternoon at UN Headquarters in New York. Yesterday, the records of the UN War Crimes Commission, which was operational between 1943 and 1948 and played a vital role in preparations for the war crimes trials that followed the Second World War, were made open to the public at the United States Holocaust Memorial Museum in Washington, D.C. Copies of the Commission’s records were provided to the museum this past July, although they were not freely available to the public until now. Speaking at the panel discussion, United Nations War Crimes Commission Records (1943-1949): Past, Present and Future, Adama Dieng, UN Special Adviser on the Prevention of Genocide, underscored the importance of acknowledging the Commission’s legacy in terms of dealing with war crimes today. “The United Nations War Crimes Commission was an important international justice initiative, but its work has largely remained in the darkness,” Mr. Dieng said. Noting the significance of getting nations to agree so many years ago on setting up a central authority to investigate and make recommendations on war crimes, Mr. Dieng said the release of the archives to the public also represents a significant reminder of the importance of gathering and keeping records and bringing perpetrators of war crimes to justice. The archives of the War Crimes Commission contain evidence submitted by 17 Member States, including lists of alleged war criminals, files of charges brought against them, minutes of meetings, reports, correspondence, trial transcripts, and related documentation about the activities of the Commission, its committees, and individuals identified as alleged war criminals, including evidence compiled against them and records related to their prosecution by national tribunals. Although some of the information in the documents has long been known to investigators and historians, prior to the Commission’s records being made available to the Museum, the public was unable to view the documents. Researchers at the UN, for instance, must petition for access through their governments. In an interview with UN Radio, one of the panellists of today’s roundtable, Bridget Sisk, Chief of the UN Archives and Records Management Section, underscored the significance of ensuring that a record of what occurred during the Commission’s time of operation is kept. 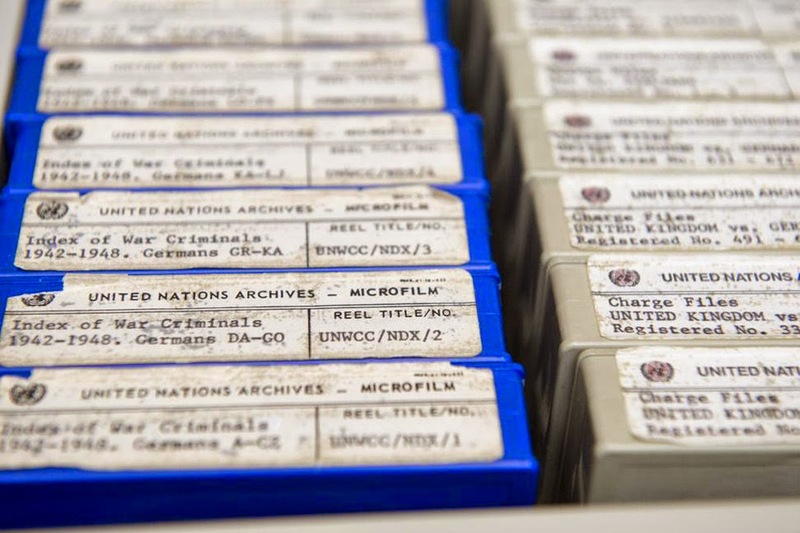 “We hope that the interest that’s been generated in the archives of the War Crimes Commission will stimulate greater research in the UN’s archives,” she stressed. “We have archives spanning 108 years of history. But we also hope that it stimulates some momentum in the Organization among stakeholders to make sure that the digital records that the Organization is creating today of bodies such as the Commission are created and managed appropriately,” she added. Speaking during the roundtable, Ms. Sisk highlighted that most of the charges discussed in the Commission’s records have never been subjected to judicial review. She also noted that the rules regarding access to the records were not seriously challenged until 1986, when “intense pressure” led the Secretariat to a review of the policy following allegations that Kurt Waldheim, who served as UN Secretary-General from 1972 to 1981, had himself committed atrocities during the Second World War. Even today, Mr. Sisk said, the number of requests to the UN for access to the Commission’s records is “strikingly low,” averaging five or fewer per year. Opening the roundtable, Hua Jiang, Officer-in-Charge of the UN Department of Public Information, provided a history of the Commission and underscored the importance of the event. “Our goal today is to examine the Commission and to discuss the value of its records, not just from historical and legal points of view, but also in regards to their potential use by researchers, editors, and students,” she noted. The event’s keynote speaker was Ambassador Asoke Kumar Mukerji, Permanent Representative of India to the UN, who noted that the Commission was a “unique endeavour,” and that the UN did not exist when the Commission was established. Other panellists at the roundtable included Patrick J. Treanor, former member of the Office of Special Investigations of the US Department of Justice; Dan Plesch, Director of the Centre for Diplomatic Studies and Diplomacy of the University of London, who was among those who initiated the call in 2007 for the release of the archives; and Henry Mayer, Senior Adviser on Archives of the United States Holocaust Memorial Museum. The discussion, which was moderated by Edith Lederer, chief correspondent for the Associated Press at the UN, forms part of a series of events marking the 70th anniversary of the end of the Second World War and the founding of the UN. The event took place in accordance with General Assembly resolution 60/7, which was adopted on 1 November 2005 and deals with Holocaust remembrance. The roundtable was organized by the Holocaust and the United Nations Outreach Programme of the UN Department of Public Information.